On this episode of the podcast ‘Homeless in San Diego: Real People, Real Stories,’ host Greg Anglea, CEO of Interfaith Community Services, is joined by his colleague Richard Biddle, Rapid-Rehousing Specialist at Interfaith Community Services, to give listeners an in-depth look at what the term “rapid-rehousing” means, what it takes to move families off of the streets, and how his role as a social worker plays into the process. Greg and Richard are then joined by Interfaith Community Services’ rapid-rehousing program participants Duane and Danielle (along with their 10-week old baby! 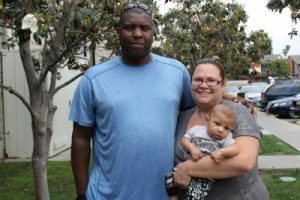 ), who share how they found themselves camping in El Cajon with their four, soon to be five, children for nearly 8 months until they were able to move into a home of their own. Donate household items to Interfaith Community Services’ “Make it a Home” program. Items needed include, but are not excluded to: new bedding & bath towels, kitchen items, new or lightly used furniture, bathroom & hygiene supplies, and more. To learn more and schedule your donation, please click here. Landlords, property managers, and property owners with units available for lease, please consider renting your apartment to a homeless family in need of a place to call home. By working with organizations such as Interfaith to house homeless families (often for additional financial incentives like double security deposits), you can make a difference in our communities today. Click here to learn more.